Yup. I went with it. 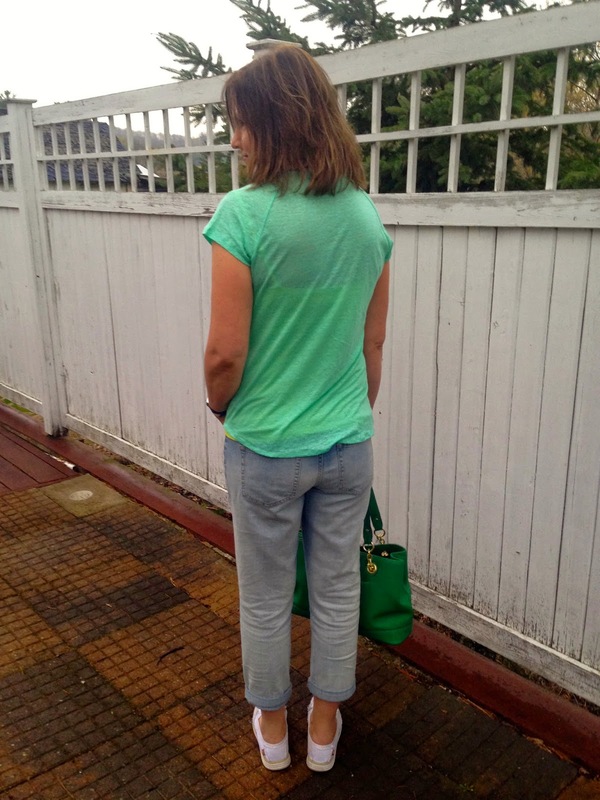 My second Fashion Post of the week will always be titled 'What I Wore Shopping'. Like I said in my two previous friday fashion posts: I only wear 'real clothes' twice a week: once to church, and once to go shopping; and since most of my readers can totally relate to real life fashion…it seemed the logical thing to do. I have read on many fashion blogs that no one over forty should wear a graphic tee. Well if that's true, they better tell all the sports fans, proud alumnus, Jesus lovers, support groups, band groupies, and home state lovers, to stop wearing their tee shirts! Nah, not gonna happen. Who makes these rules anyway? I love tee shirts and I wear all different kinds, with or without words or graphics, because they fit my casual lifestyle. There are no restrictions for age as far as I am concerned. Today's tee shirt I wore on a cool, misty spring day. It was one of those days where one minute it's cool, cloudy, and a bit misty, and the next minute the sun comes out and your hot. So I wore a scarf and jean jacket (old, Express), to keep me warm when the sun hid behind the clouds. My outfit consists of three J. C. Penny items: the Linen Graphic T-Shirt, a.n.a boyfriend jeans, and a green Liz Clairborne hand bag (similar). 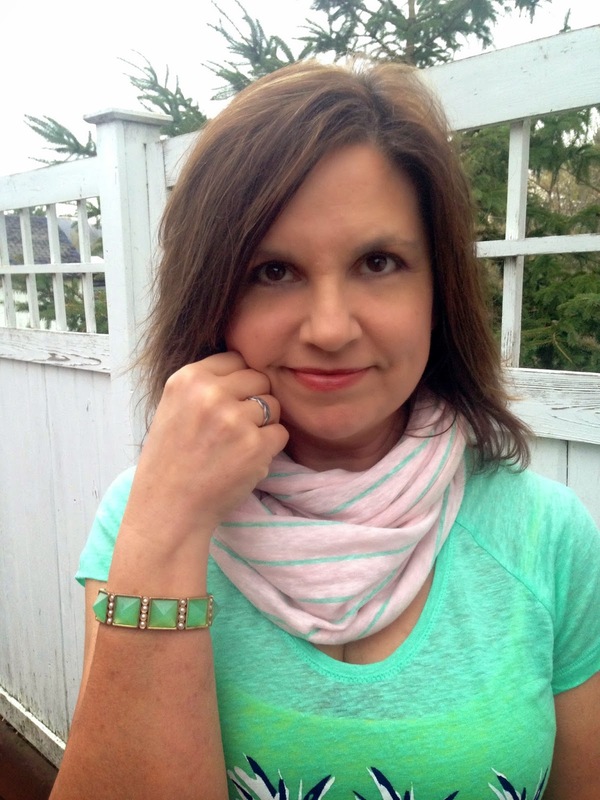 For jewelry, other than my usual cobalt blue watch and rings, I wore a jade bracelet. My scarf is a knit material and is from The Gap (old). I know a lot of women don't like sheer tees, but they are my favorite. I don't like traditional tee shirts because I find the material too thick, heavy and uncomfortable. I really like the option of having layers in the summer, because if it gets really hot I could remove the tee shirt, or, if I'm worried I'm getting too much sun, I have the cover up of the tee without all the extra weight. I thought the colors in this shirt was so fun and summer-like. I sent this picture of myself to my daughter and she replied 'Cute! Your looking very Floridian!'. 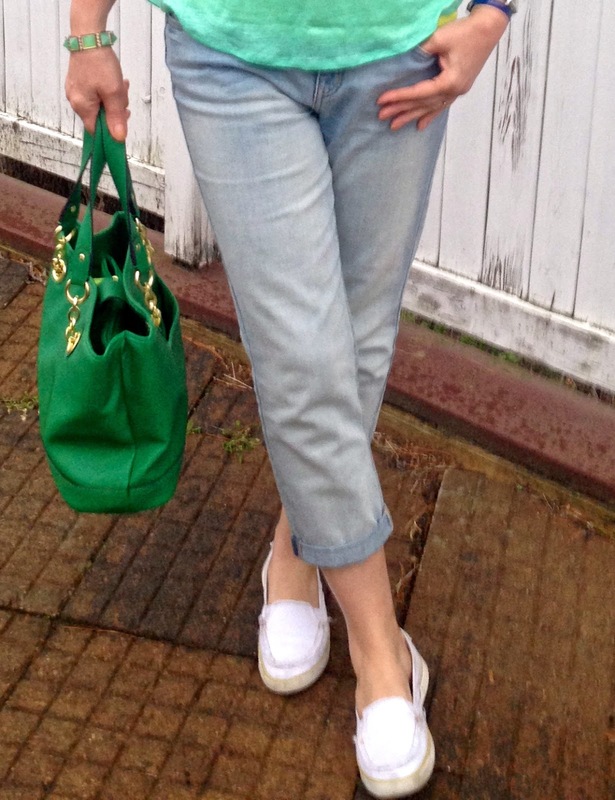 I love the laid back feel and look to boyfriend jeans, and the light wash denim is perfect for spring. My loafers are old, they are by Dr. Scholls so they are very comfortable. I always try and buy at least one new hand bag every season, and this year I bought a green one after reading Bridgette's Rae's article "Why You Need a Green Handbag". She says that 'Green has often been called a colored neutral, meaning that it is a color that will work well with just about any color it is paired with.' Bridgette also states: "If you want to buy a pop color in a handbag, but also don’t want to be limited in how you can use it or want to be able to grab it with just about anything you are wearing, you can’t go wrong with green." I thought Bridgette's logic made sense, and I liked the idea of bringing a pop of color into my spring/summer wardrobe, so I bought the Liz Clairborne bag and put the theory to a test! My results? Yes, the bag went with a majority of my outfits, but there were a couple of times the color clashed and I had to change bags. But that's o.k., who wants to carry the same bag everyday anyway? 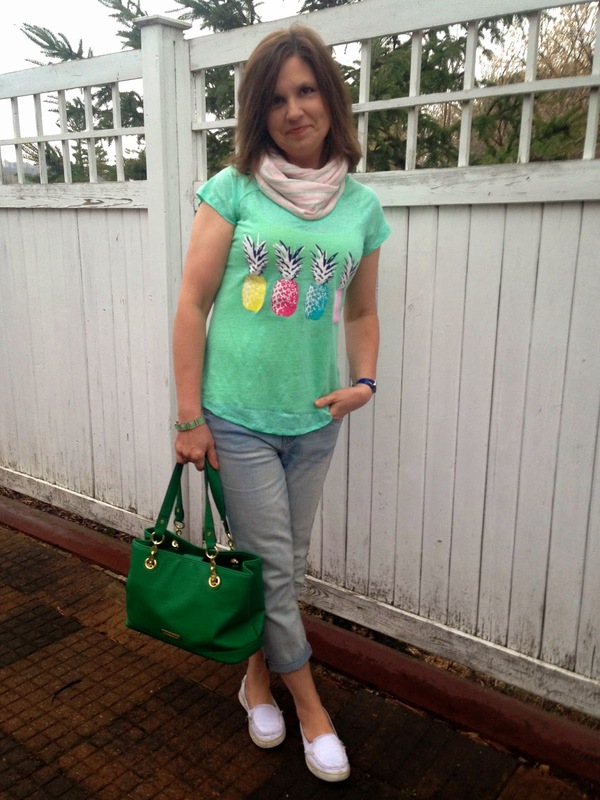 The tank top that I wore under my sheer tee shirt was a lime yellow color….so it added to that tropical feel I love! Linking Up With: Fashion Should Be Fun, Casual Friday, Not Dead Yet, Let it Shine, How I Spring, Manic Monday, Mingle Monday, Link Up with Lisa, On the Daily Express, and Charming Friday. I'm 48 and love my graphic tees! 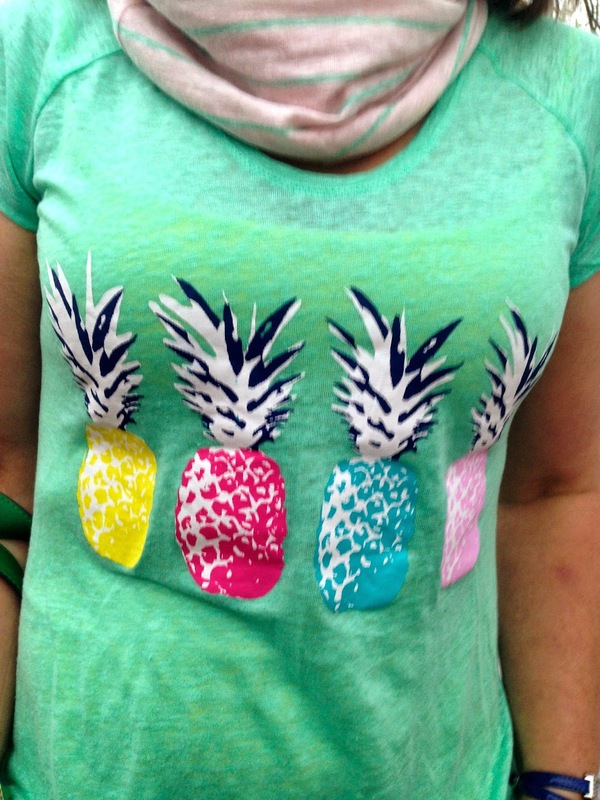 And who could rest a pineapple tee? Adorable! Thanks so much for sharing with Fun Fashion Friday and have a beautiful weekend! Great look - I'm almost 60 and still loving my graphic tees! Thanks for sharing with Visible Monday, xo. Perfect outfit for shopping! I love the fun pineapple tee.